When you are working with heavy equipment of any type it is most important that they are secure when parked. Runaway vehicles pose a serious threat to the health and safety of workers throughout the country. 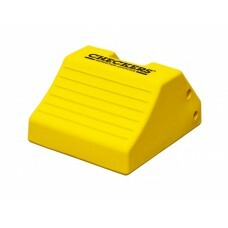 Our chocks are used by the military, mines, harbors and warehouses. If you have ever been around large vehicles you will be familiar with heavy duty tire chocks. Our heavy duty wheel chocks are a safe and OSHA approved method of preventing the movement of heavy trucks during loading or unloading. The Best Selling Wheel Chocks in the Mining Industry. MC Series wheel chocks are approved and used by some of the biggest mining firms out there. Weather-resistant construction, will not go brittle in the cold. Our chocks are made from an incredibly durable yet lightweight urethane material. This makes them ideal for rough environments such as mining, drilling, for use with vehicles such as loads, haul trucks, and cranes. The MC series of heavy duty truck chocks features replaceable rubber traction pads and optional ice studs for excellent grip on almost all surfaces. The urethane material used is harder wearing than rubber and is not affected by fuel, oil and solvents all of which are frequently found in industrial environments. Unlike a rubber wheel chock, these heavy duty items will not go brittle in the cold, or deteriorate in direct sunlight. Our polyurethane chocks are nonconductive and unlike aluminum chocks they have no sharp edges and are far less likely to cause any tire damage. All our chocks are supplied in either hi-viz yellow or other vivid safety colors, making them easy to locate when needed. The MC3000 heavy duty wheel chock can deal with super heavy loads when deployed correctly. To ensure it is used correctly the MC3000 chocks have ANSI compliant guidelines molded into its surface in English, Spanish and French. No matter the size of vehicle we have a chock for your needs. Our largest chocks can restrain a vehicle with tires up to 165" in diameter. There is a table on our main wheel chocks page that covers getting the appropriate chock for your vehicle. Without chocks a simple vehicle failure can result in fatalities. Proper chocking of tires is required to prevent a simple mechanical failure becoming something far worse. It is required under many health and safety guidelines to ensure proper worker safety. Our heavy duty range has many accessories to assist with the transport, storage, and use of the wheel chocks. These simple stainless steel studs can be screwed into the base of the chock to provide improved traction on snow and ice surfaces. There are trolleys available to assist with the moving of extra large truck wheel chocks such as those in the MC series. Loading docks require that Semi trailers are restrained with wheel chocks during loading and unloading. It is common for trucks to carry their own wheel chocks with them. We provide mounting brackets to make transporting wheel chocks easier on our accessories page. 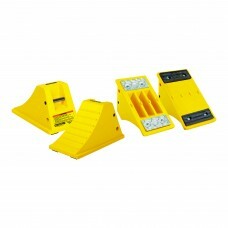 Not sure which is the best heavy duty chock for your needs? Give us a call toll-free on (800) 671-9662 for further information and assistance in finding the right heavy duty truck chock for your needs.